Artemisia annua is an aromatic, herbaceous plant native of Asia, a species which stands out from the rest of its genre as an excellent and important source of clinically proven therapeutic compounds. Artemisia annua L. produces a range of complex terpenoids in its trichomes, amongst which artemisinin is of special interest for the treatment of a range of pathologies. In addition, the plant produces other substances such as flavonoids (artemetin, chrysospleneti, chrysosplenos, crinilineol and eupatorin), phenolic acids and coumarins, which increase the impact and efficiency of artemisinin via a phenomenon called pharmacodynamic synergy, as well as acting as an antioxidant and stimulating the immune system. 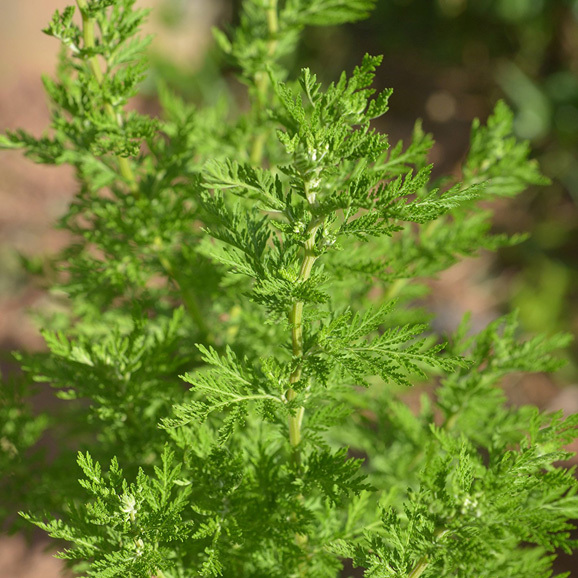 Artemisia annua is able to grow in a variety of habitats, including forested margins, semi-deserted slopes, saline and rocky fields, and at an ample altitudinal range, meaning it is relatively easy to cultivate in many climates, from tropical regions to arid ones. Its life cycle is long, 7 to 8 months, which is when it reaches its maximum growth and flowers, also the point at which artemisinin reaches its greatest concentration in planta.